Geneveve Morales is working as an interpreter, helping people fill out unemployment applications in the wake of the fire that took their jobs. The majority of Farmland's workers are Spanish speaking. Listen to her story. County and state officials discussed relief options for employees who are currently out of work at the Farmland Foods plant in Albert Lea Wednesday. The meat-packaging plant, the second largest employer in Albert Lea, is assessing damages and may announce plans for the facility later this week. BEFORE CINDERS COOLED, government officials and relief organizers were brainstorming about what kind of help would be necessary for the nearly 500 employees without jobs. Many workers have already filed for unemployment. Minnesota Department of Agriculture officials announced they're a source for low-interest loans. The Salvation Army is holding extra food-pantry hours and a buy-one-get-one-free deal. The Albert Lea Chamber of Commerce president is planning a job fair. And Freeborn County's United Way started a $20,000 relief fund, which could grow with community help. City Manager Paul Sparks says it's important to remain optimistic. "I've been around here quite awhile. I've seen two bankruptcies with this plant, two closures and now a fire. (It's) going to be awhile before it gets turned around. I think everybody has to accept that or understand that. The main thing I want to get across is everything's going to turn out alright. Somehow this is all going to work out," Sparks says. Geneveve Morales, who was called in by the state to help Spanish speakers interpret unemployment applications, says many are worried. In the last 10 years, the majority of the workforce has become Spanish-speaking, with new residents to Minnesota. "It's very hard, especially if you have a big family, and they say, 'I don't speak the language. I don't want to move.' There's some that don't have transportation. They arrive to Albert Lea by bus. They just don't know," she says. Morales says that most employers in the area prefer to hire English-speaking employees. Javier Rodriguez and his friend are two such Spanish speakers who moved to the Midwest from Mexico for the jobs. Rodriguez says he's moving to California where there are more jobs for Spanish speakers. Other Farmland employees say it's too soon to say where they will be in the next few weeks. 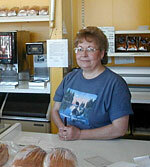 Helen Bunnell works next door to the liquor store at Doughnut Hut. She says if the plant closes it might hurt business. "If the people move out of town and don't find other jobs, it's going to hurt the community. It was a real shock and a bad thing that it happened. We hope it will be built up again," she says. Farmland Foods officials will tell employees on Friday whether the plant will stay open. The announcement will be made at the new high school, where workers can also pick up their paychecks.